Visualise and manipulate your KNX / EIB installation with RTI (remote technologies inc.) systems. You may establish with this gateway a bi-directional communication to your KNX/EIB installation. This gateway offers like any other KNX bus device communication objects that are assigned to group addresses with your ETS software. No ETS plugIn will be necessary. The big advantage of this system structure is, that this gateway acts like a server. The actual state and data of your lights, blinds, shutter and HVAC are available in the gateway. If a client connects to this unit, it may directly read all relevant data by Ethernet. No bus request is necessary, no additional bus traffic may encounter communication problems, no delay to visualize the data. One system for your media equipment and your KNX installation: It’s under control! There are no real limits to use this configuration, as the automation controller and the KNX gateway are cascadable and may be used according to the size of your project. 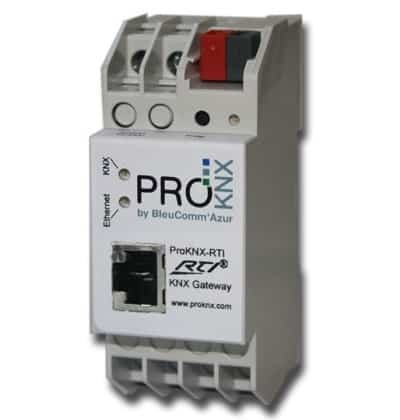 ProKNX offers a driver for the RTI integration designer to control the KNX/EIB installation. You may get free of charge the ProKNX driver as a software module to include in the Integration Designer Software. In addition you’ll need the ProKNX-RTI gateway to establish the physical connection to the KNX bus. You may do all kind of switching, dimming, shutter, HVAC and scene control. KNX Scenes may be adjusted and stored. HVAC controller may be switched to different operating modes. Temperatures, luminosity, wind speed and other physical data may be shown. It is also possible to use KNX commands in macros with only one button press. This is to recall a KNX scene (dimming lights, closing shutters) when starting Home cinema e.g. You may even create events on KNX commands: Change the volume by pressing a KNX button for example. Of course any user defined buttons or sliders may be used.